On this page, you’ll find resources to help you become educated on various allergic and immunological conditions that are commonly confronting students and the public today. If you, your students or someone you love is affected by allergies or immunological conditions, you should take the time to read publications below to become informed about best practices, sample policies and emergency plans to help individuals, schools and organizations develop effective management strategies for reactions and other consequences of these conditions. Always consult a physician in concert with staying informed about treatment tools and procedures for these afflictions. The Canadian Society of Allergy and Clinical Immunology (CSACI) advances allergy, asthma and immunology knowledge to optimize patient care across Canada. These publications will be revised as necessary to incorporate new information based on the latest research. 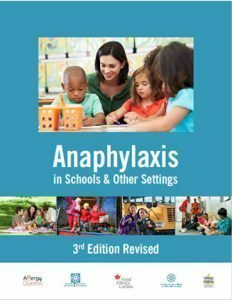 Developed by Food Allergy Canada and Leap Learning Technologies Inc. in collaboration with the Canadian Society of Allergy and Clinical Immunology, the online courses for the community, schools and child care settings focus on the prevention, recognition and management of anaphylaxis. 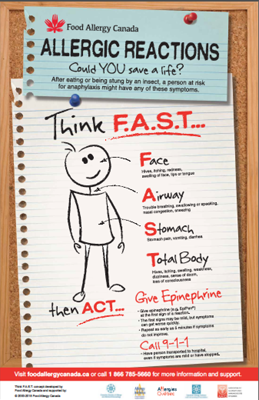 (1) The Anaphylaxis Emergency Plan with EpiPen instructions fillable. You can download, fill in and save your information OR print a copy and add your information by hand. 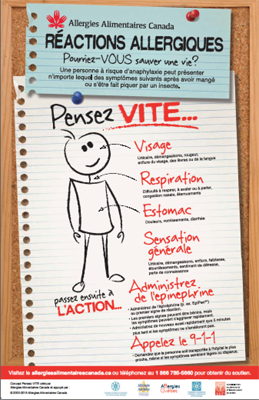 (1) Le plan d’urgence pour l’anaphylaxie est un formulaire remplissable à l’écran. Vous pouvez télécharger le document, le remplir et sauvegarder vos renseignements ou en imprimer un exemplaire, pour ensuite le remplir à la main. (2) Il est possible d’utiliser d’Adobe Acrobat pour ajouter une image (.jpeg, .png, etc.) ou Adobe Acrobat Reader pour ajouter une image (.pdf seulement) dans l’encadré « PHOTO » du plan d’urgence pour l’anaphylaxie prévu à cet effet. Pour ce faire, veuillez suivre les instructions associées à la version du logiciel Adobe que vous utilisez. Vous pouvez également imprimer le formulaire dûment rempli et apposer une photo dans l’encadré.